Discussion in 'Discussion' started by NelsonP, Mar 7, 2019. Wow that's quite a lot pedals along side the HX FX. I would have thought it would be able to replace all of those. What are you using the hxfx for? So a lot of reasons why I love this setup and even (probably) prefer it to a larger solution like a full blown Helix LT or Floor. Im using the buttons on my AA3 to choose from 6 patches, and truebypass chorus and phase 90 clone pedals to add tonal options. Was also using a cleanboost but my new Majesty guitar has a pushpot switched one built in. My current setup is a Dunlop Mini Wah, Boss TU-3 tuner, Atomic Amplifire 3, with an Eventide H9 Max & Core in the effects loop. There's a Boss NS-2 Noise Suppressor in the mix as a master mute switch (sort of 4CM between its internal effects loop and the Amplifire's loop; an trick from my Marshall head days). Prior to that setup I had a full size Wah, Ibanez TS-9 Tube Screamer, an unknown hand built fuzz, Green Russian Big Muff clone, Boss DS-2 Turbo Distortion, Boss PH-2 Super Phaser, and MXR/CAE Line Driver in front of the Amplifire and a Boss DD-5 Digital Delay and Boss CE-5 Chorus Ensemble in the loop with the Eventides. I needed money so the setup had to slim down. NelsonP and Madmax like this. Overdrive (AT+ for now) before the Amplifire 6, and H9 Max in the loop. However, I'm not satisfied with the way the AT+ behaves here, sounds much better on my other rig... so I'm keen to know what else are you guys using IN FRONT of your unit? I've now got a Pitchfork, Soul Food and EP booster in front of the Amplifire. Very happy with those. EP boost is set up with unity gain setting (+3dB boost off, bright switch on) to give a lift to my overall tone. Works v nicely on the Deluxe and Plexi models. I don't like it on the 65 Clean model and it's not really necessary on the higher gain stuff (which for me is Friedman). Soul Food works well on pretty much all of the amp models I use (Fender, Marshall, Friedman), although on the higher gain ones it can also be be OTT. However, my small board is quickly getting bigger and GAS is getting the better of me. I am currently moving everything onto one, bigger board, adding a midi looper and considering an EXH Big Muff (not sure which one yet - will be either the Nano, Russian or OP amp reissues), to run into a clean Deluxe preset. Are you running it in front of an amp model, or using it like a pre-amp in front of a power amp model? I initially struggled using my Friedman BE OD Deluxe in front of the Ampli Firebox....but it really came to life when I dialed it in along with the KT88 power amp model. Did take quite a bit of tweaking. I'm using it front of everything as an overdrive and boost pedal. The background of that pedal is that I used the same way on my other pedalboard, in front of a preamp, or in front of my hot rod deluxe... and it always sounds unreal... but with the amplifire6 not so much. I'll give the soulfood a try as someone suggested. I shall report back. I really enjoy using the Soul Food in front of mine. I use it as an overdrive, not a boost. An OCD style pedal works great as well, if you’re into that sort of thing. I use an OCD style pedal into an edge of breakup AC30 on my AA3 and it sounds great. AFB set up like a single channel amp, being pushed by the two drive pedals. Ventris, Nemesis and Trelicopter are placed after it, so that I don't have them going into a breaking up amp. This whole setup is working really, really well. 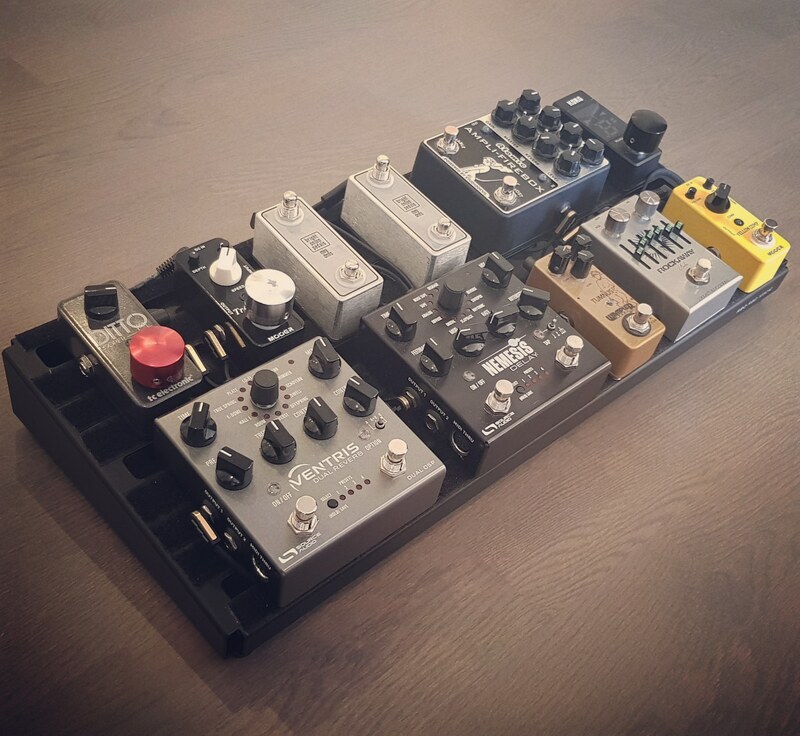 Let the AFB do what it does best, and keep all the strengths of a traditional pedalboard. NelsonP and Filipe M. like this. So, I've tried replacing the AT+ with the Soul Food, and that works really well. Thank you so much for the suggestion.